Atlantic Sea salt, Dead Sea salt, Epsom Salt, organic Jojoba oil, organic Lime essential oil. Simple, yet nourishing and healthy for your skin. What kind of benefits do sea salt give your skin? I asked Justin from Simply Bath Salts and this was his answer "The advantage of adding bath salts to a warm bath are that the skin is able to absorb many of the nutrients in the salts, in particular the magnesium which many people are deficient in and is a great stress reliever. Really there are dozens of minerals in the salts - calicum for bone health, bromide for muscles, potassium & sodium always need maintained at an even level which soaking in the salts can help. We also add Jojoba oil to moisturize the skin and essential oil adds aromatherapy qualities. " Basic, recyclable packaging completes the product for a complete Eco-friendly bath salt! I tried the Lime scent in my jacuzzi tub and it was so wonderfully scented! Not overpowering, just a natural lime scent. I wished it would have lasted a titch longer in it's scent and I would have been quite content if I would have smelled like a lime when I got out, but I didn't. I did not notice my skin being overly moisturized when I got out, nor was it dried out in anyway. 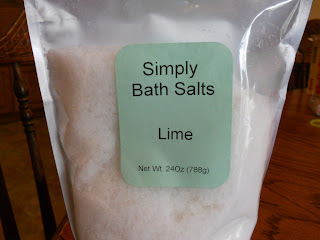 I love how Simply Bath Salts uses only natural essential oils in it's fragrance line. They have a vast amount of fragrances to choose from! Simply Bath Salts has a quantity discount with the more bags you buy as well so you can order a variety at one time and save money on them! Follow the Rafflecopter for entries and be sure to give some love to Simply Bath Salts on their FB and twitter sites!! I think the benefit is ralaxation.